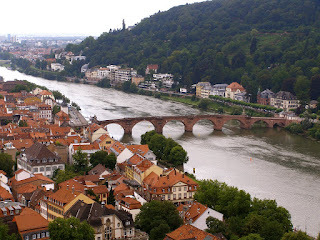 Two weeks ago, Sean and I went to Heidelberg. While I spent days in session at a conference, Sean wandered around the city and took lots of good pictures for me to blog with. 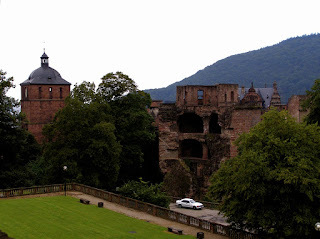 Heidelberg is a cute little city on the Neckar River, a 2 and 1/2 hour train ride south from Bonn. 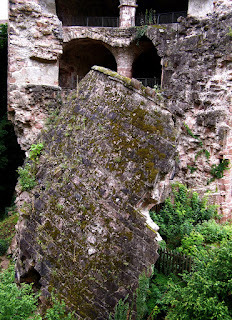 It's also one of the biggest tourist attractions in Germany. On the right side of the pedestrian bridge, there's a the Philosophenweg, a narrow path that winds it way up the hill: very cute. On the left side of the bridge, the old city is full shops, restaurants, and beer. The main street, Hauptgasse, is a pedestrian walkway. A block from our hotel (loud at night with people on the street and cars roaring up the narrow street, but quiet during the day), we went to a place that brewed their own beer (one was 33% alcohol) and I had a weissbierbowle (beer, champagne, and strawberries); I don't care what people said, it was quite yummy. 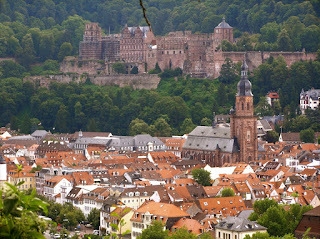 Above the city is Heidelberg castle. 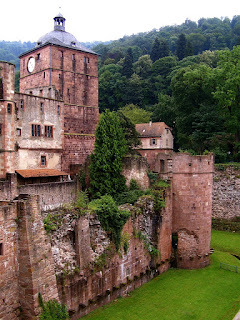 It was pretty cool, a mix of different periods and all rather ruin-y. You could go down and walk through the moat, which was pretty cool. And one of the towers was split in two with half sunk on it's side. The castle perched on the side of the hill is pretty impressive! The ruins must be a lot of fun to explore. /wishes he is a kid a again. 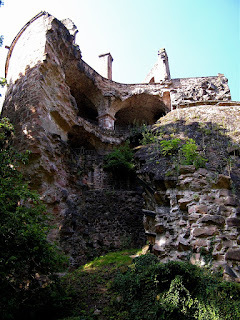 There were a bunch of places in the castle that I could see (and wish I could explore) that were off-limits to visitors. 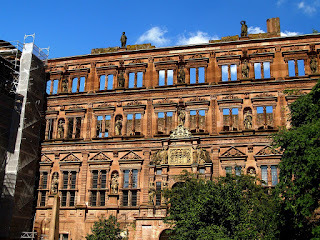 By the way, Sean's blog has a better description of Heidelberg (and different pictures).